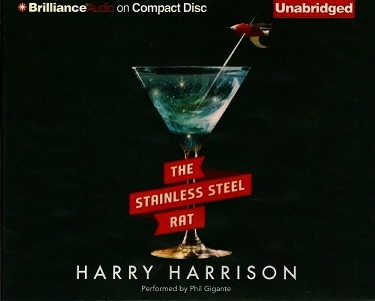 Harry Harrison received word from his agent on Monday that The Stainless Steel Rat audio book, read by Phil Gigante, and published by Brilliance Audio, has been nominated for an Audie award in the science fiction / fantasy category. Here is a link to the press release on the Audio Publishers Association website. The awards are to recognise “distinction in audiobooks and spoken word entertainment sponsored by the Audio Publishers Association (APA).” There is also an Audies website. I have the Brilliance audio book of The Stainless Steel Rat Returns, also performed by Phil Gigante, and he does a great job of bringing the story to life. The audio books are unabridged readings, available on multiple CDs or on a single MP3 CD — well worth checking out.